We are unashamedly animal people in our house. We have Otter the Chihuahua (4 years old), Tasha the half Burmese (8 years old), Delphi (half Burmese 8 months old) and Diego (black short hair 9 months old), and Ashlea's two rats, Heidi and Audrina. We love each and every one of them with all our hearts. When we suspected we might have prowlers it was the only excuse we needed to consider getting another dog. A big one. Not to raise as a guard dog, but just because big dogs are often just a deterrant in themselves due to their size. Because Otter is tiny and is prone to knee dysplasia we can't have rough and tumble games with him. Heck - he's only half the size of the cats!! But in order to get a big dog that would not be unmanageable for Otter we decided it either had to be a mature dog that is good with other dogs and cats and past it's puppy exuberance so that tiny Otter didn't get trampled....or, it had to be a puppy that we could teach how to be social with Otter without hurting him. Firstly, we tried an adult dog. We found a beautiful neutered male Huntaway who belonged to a single mother of a little girl and a baby and who was finding having a big dog a struggle to look after. Chase was beautiful and loving and very receptive to commands and learning new things. We took him home on a two week trial. Chase was so lovely, and appeared to settle in well. After 3 days we were starting to make long term plans. He'd freaked out poor little Delphi on their first meeting but she was coming right. Otter nearly had a coronary and did nothing but bark for 24 hours until he virtually lost his voice. But then he started coming round too. We took the two dogs for walks together and things seemed good. But Chase bonded with us a little too well. On Day 4 he started preventing Otter from coming to us and by the end of the day his dominance was becoming stronger. We had made a pact that our existing pets came first and if whatever we took home had a negative impact on any of them, then it would be back to the drawing board. And, since that was the whole point of a trial period, Chase got returned to his owner - who had missed him so much that she decided to try harder to make it work with him and two children. At this point we were very interested in two other dogs who lived together and whose owners were moving overseas. One was a speyed female border collie cross, the other a neutered male boxer cross. Both had beautiful natures, but the owners wanted them to go to a home together and we could only take one. The owner's friend took them both on trial with the understanding that if it didn't work out we would take one on trial. It worked out, which was the best result for them. We would have loved to find a rescue dog and had checked out two local animal shelters and the pound but found nothing suitable. They were all either too old or unsuitable breeds or temperaments. Back to the drawing board. We decided to go with Plan B which was to get a puppy to train to get along with Otter and the cats. And we found Keeper. His mother is a purebred Golden Retriever named Meg who got out while on heat. I fell in love with Meg's sweet personality when we went to see the puppies. 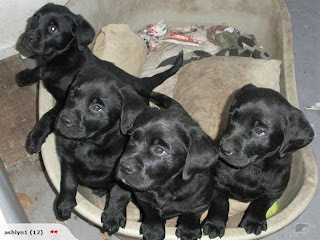 The suspected father is the purebred black labrador who lives down the road from Meg. The vet is almost 100% certain that the puppies are Black Labrador and nothing else. Keeper was the puppy who stayed to play when the others had tired of us and wandered away. He was the one who wanted cuddles. And he was the one we came home with at 8 weeks old. 12 weeks post dew claw removal - they stuck out badly! He is working out beautifully. He is respectful of Otter, sometimes forgetting himself but if Otter barks at him he remembers the pecking order and backs off. Two of the cats love him - older Tasha has always kept her distance from other animals. Keeper and Delphi have developed a special bond and smooch and play together. Of all three cats, she is the most kitten-ish in her behaviour, and I think this is why they get along so well. Keeper has finished a puppy obedience course and passed with flying colours. He has just begun an adult obedience course and I expect he will do well at that too. He seems to catch on to commands quickly. He's been fully housetrained for a month now, and started sleeping outside in his kennel without a murmur. He is already a full part of our family and we wouldn't be without him. Even after he chewed my cellphone ha ha. Fortunately still operational - just not very pretty. So, welcome Keeper. We love you.